Shaken by recent natural disasters in Mexico, the Caribbean and the United States, ESF students had one question on their minds: "What can we do to help?" And so, "Acorns to Action" was born. "Our primary goal is to provide the needed resources and knowledge to the impacted regions so they may rebuild their communities in a sustainable way," said Isabella Kaplan, a senior environmental studies major who helps lead the project. Since the end of September, Acorns to Action has raised $700 in disaster relief through fundraisers, cultural events and collection drives. The students also hosted informational sessions to increase awareness of the need for disaster relief, and discuss the possibility of increased academic involvement and research in communities impacted by disaster. Acorns to Action has partnered with relief and aid organizations from affected areas and Syracuse-area groups to increase the impact of their efforts. Students helped local churches load trucks with relief supplies and collected donations before the Syracuse University-Wake Forest football game. "Rather than sending water and food to these countries, we provide the resources they request and the tools/knowledge required to rebuild their country in a sustainable and socially just way," said Kaplan. Acorns to Action takes its name from Oakie the Acorn, the beloved mascot of ESF's athletic teams, the Mighty Oaks. Kaplan was inspired to lead Acorns to Action after seeing a video from Mexico that was shot during the September earthquake. "A friend from Mexico showed me this terrifying video of her sister's college just collapsing," said Kaplan. Soon after the earthquake in Mexico and hurricanes in the Caribbean, Mark Lichtenstein, ESF's chief sustainability officer, hosted a meeting for students interested in helping those affected by the disasters. "In high school I did four years of fundraising for childhood cancer research," said Kaplan, "so I know a little bit about fundraising, and I figured I might as well give a hand to the community." 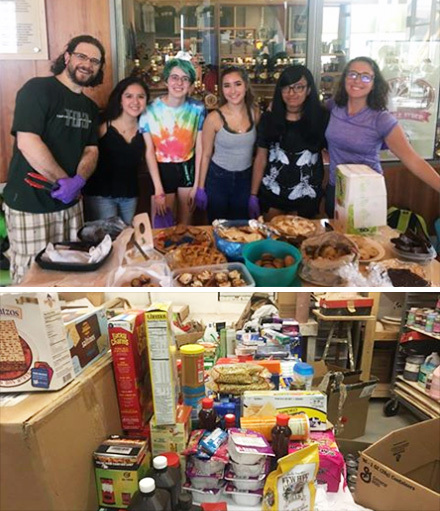 During the fall semester, Kaplan and a half dozen other students coordinated fundraisers and collaborative efforts with other Syracuse-area organizations including Hendricks Chapel and CNY Project HOPE. "I'm like the middle man," said Kaplan. "If people have an idea for a project then they run it, and I support them with Facebook posts and talking to my connections to give them information that I have." Part of that support is developing a database of reliable disaster organizations to donate to. "We choose a country by which students want to lead a project," she said. "So if a student says they want to raise money for Puerto Rican farms, or have a salsa dancing fundraiser for the Virgin Islands and Mexico, that's the area that benefits from their efforts and I help them." Graduate student Farah Nibbs, took charge of a drive for her home country of Dominica. "Most people were evacuated off the island," said Kaplan, but it hasn't received much media attention. Acorns to Action held a donations drive in collaboration with the Community Art and Folk Center in Syracuse and also hosts an Amazon.com wishlist where people can purchase items to have them sent to Dominica. Donations are being sent to and distributed by Nibbs' church in Dominica. Because ESF has students from every country in the region that was hit by a natural disaster this fall, the group tries to address needs in each location. "There's no way we can not help when asked," said Kaplan. Beyond fundraising the group's activities include advocacy with members writing open letters and petitions to state and federal officials to raise awareness of the need in the Caribbean. They also use their social networks to promote events and activities organized by other groups working for the same purpose. People don't have to be in Acorns to Action to help. "Sharing a Facebook event or the Amazon wishlist is helpful," she said. While there will be more fundraisers in the spring semester, Kaplan hopes to expand the group's efforts. "I'm hoping Acorns to Action will be sustaining after work for the 2017 natural disasters is complete. I have friends who are sophomores who are involved and I'm hoping they will take over." The group's primary goal is "to take ESF knowledge and use that knowledge to give countries tools to rebuild," Kaplan said. "The fall semester was mostly fundraising, next semester try to focus on community building projects." Lichtenstein spent a week in Puerto Rico this fall and "has a lot of ideas like building solar panels and bringing ESF foresters to help rebuild the Puerto Rican forests," said Kaplan. "We want to take all the sustainability knowledge we have and bring it down to these countries." "Even though Dominica, Puerto Rico and Mexico aren't in the news," said Kaplan, "the aftermath is usually worse than the hurricane itself because people survive the hurricane, but what people are dying from is the lack of water, food and electricity." At the same time, Kaplan remains hopeful. "One of my friends is from Puerto Rico and her little cousin who's 8 years old wrote a letter about how he's surviving, and the letter goes, 'Ya know, we're sad but we come together and we're happy.' So the people are pushing through and they are doing OK."